Welcome to the Campus Copy Center! 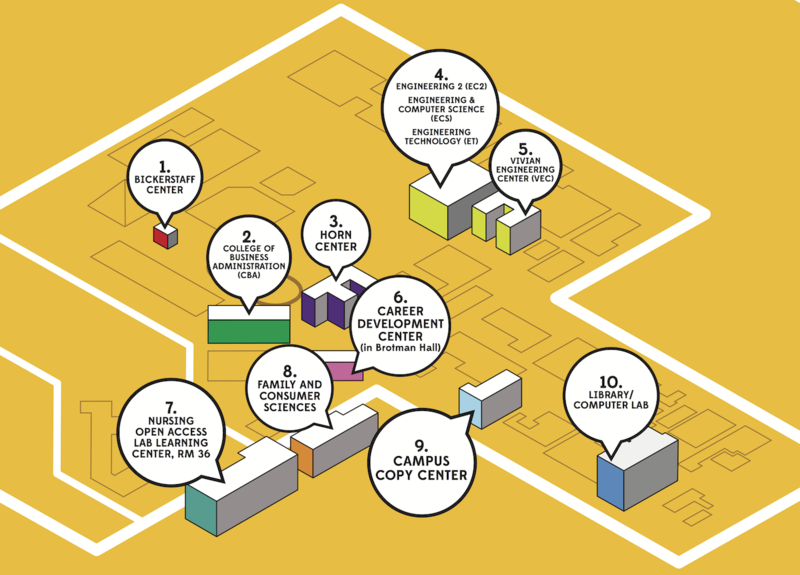 The Campus Copy Center is a full retail photocopy and business center dedicated to the students, faculty, and staff at CSULB. From digital and color copying to binding and laminating, our broad range of services and friendly staff will help you complete your projects all in one place. Offer your students an affordable alternate to traditional publishing! With our high speed digital copiers we’re able to receive your course materials and lab manuals via email and have them ready first day of classes. Don't have a digital file? Feel free to stop in with your original documents for reprint. All printing specifications must be clearly noted. Please provide clean masters. Remove all staples and paperclips. Only pre-authorized individuals listed on the account may sign for and pick up print jobs. No exceptions. The latest is Digital reprographics and printing. Reproduce color or black and white documents, brochures, and presentations in a variety of sizes. With a large selection of papers in different colors and weights, we can enhance any document and meet your tight deadlines. We have quantity breaks for larger jobs, so please call us or email CopyCenter@csulb.edu to request a quote! Full shipping service. Packaging and supplies available. The Campus Copy Center offers a full range of shipping services through U.S. Mail and UPS with a wide variety of delivery options from overnight to ground delivery. Our services are free with any course material submission. Our friendly staff will review the material, seek all copyright and permission requests, .that are required by law. Allow us to do the background work while you prepare for the semester. Permission from copyright holders is often needed when creating course materials. Permission is needed when you use a work in a way that infringes on the exclusive rights granted to a copyright holder, i.e., reproducing part or all of a copyrighted work. Don’t leave your documents scattered on the table. Whether there’s Power Point handouts for a presentation or a new restaurant menu, our services will help you create the best look your colleagues will envy. Professional business cards at an economic price. Great pricing on custom Business Cards with up to six design templates provided to offer a great looking product at one low price. Over fourteen hundred graphic art objects, icons and logos designed to enhance your Business Cards. Re-live those special moments every month of the year with a personalized calendar. Our calendars are available any time, starting at any date. We provide a quality, personalized calendar that captures all of your treasured moments to make the passing of time, that much more fun. No production is too big or too small. Call us for a quote. The staff here can help you design signs, posters, banners, charts, or oversized photos to create the perfect presentation. Order indoor or outdoor vinyl banners or custom posters in full color with professional quality. Electronic media equipped to capture the finest detail. Digital Scanning, Printing & Storage are available for you to have the finest possible presentation. No need for worn, tattered originals as we have the latest in Xerox digital reprographic machines. Course packets or Thesis copies stored in our facility for use in the future are a phone call or email away. Continental and international Fax service available. We can send local, long distance, and international faxes, as well as receive faxes. Rubber stamps in many styles, at a very competitive price. Contact us for more information. Sometimes you just want to do it on your own. On campus there are several different possibilities for students to make copies at our self-service print labs. Every machine has a brief set of operating instructions to help guide you through the process of making copies. The self-service print labs generally work with your student id card, also known as your Beach Club Card, and do not accept cash for currency. To add funds to your Beach Club Card go to any value transfer machine (VTS) located next to the copier. For more detailed information about what your card can do for you visit the ID Card Services. We offer a full range of award presentations from CSULB medallion engraving to traditional trophies or Plaques in full color sublimation or brass. Acrylic or Crystal awards, clocks or plaque lamination for awards, diplomas or certificates. For a complete list of hours for the Campus Copy Center, please view the bookstore hours here. Location: First floor of the University Bookstore. Directions to our location can be found here.